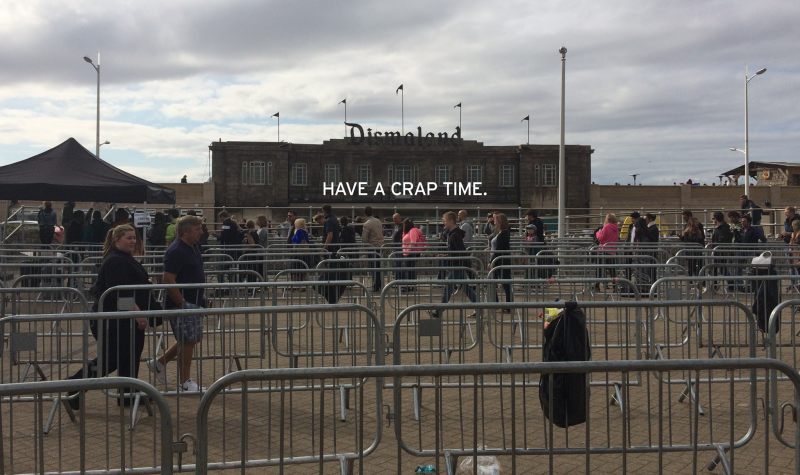 The staff at Dismaland are trained to act like alienated labor, a principle directly out of Marx, and they do not disappoint in being disappointing. When Banksy lands in a city and begins a street art-making spree, there's a routine that usually follows. First, the stenciled paintings are ignored, then, after people realize what they are, they are gawked at and occasionally vandalized. Eventually, they are cordoned off and protected from the public, and finally, they are physically removed, and someone makes a lot of money, or hopes to. An extreme version of this complex lottery played out for one unlucky family in Gaza recently. An internet hoax from 2013 is making the rounds again today, convincing people that the world's most notorious street artist, Banksy, has been arrested and unmasked. Don't worry, he hasn't. Mr. Brainwash is either a terrible artist or a great work of art. 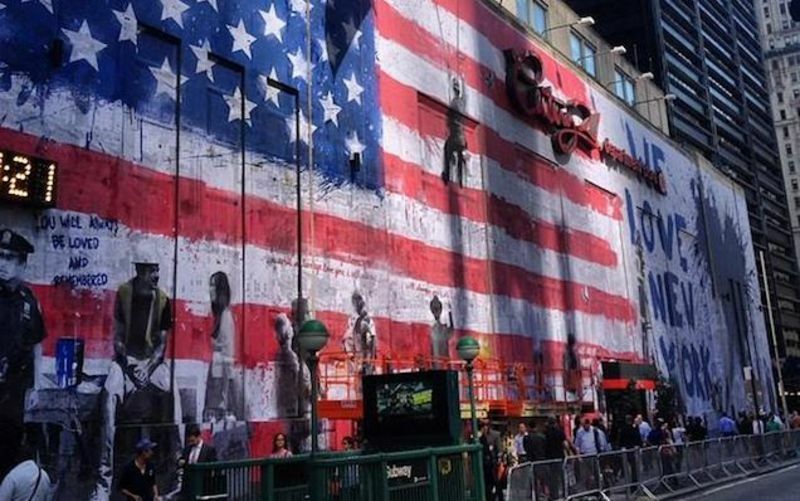 Whatever he is, he was apparently in lower Manhattan today, putting up an enormous, garish 9/11 mural on a department store across from the World Trade Center site. The line between Banksy and parody is becoming so thin that it might soon cease to exist. 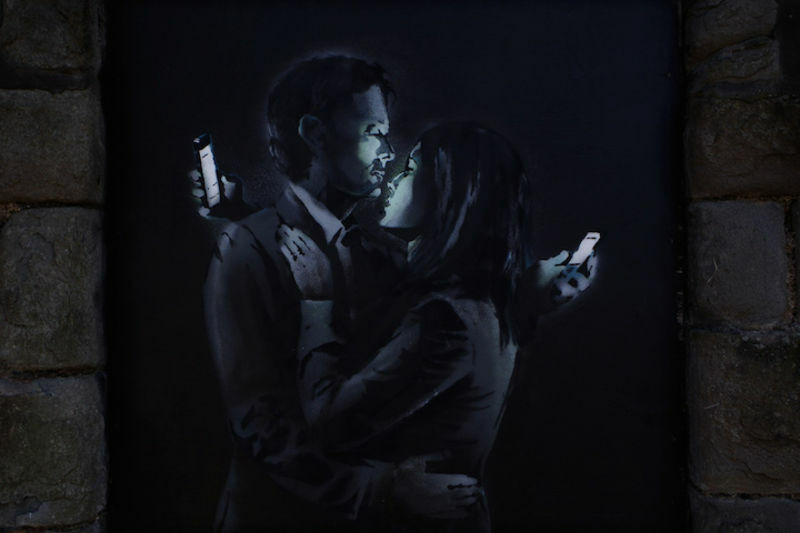 Take his new piece, up at an undisclosed location but posted to his website today, which depicts a man and a woman embracing, their faces illuminated by the glow of their phones. 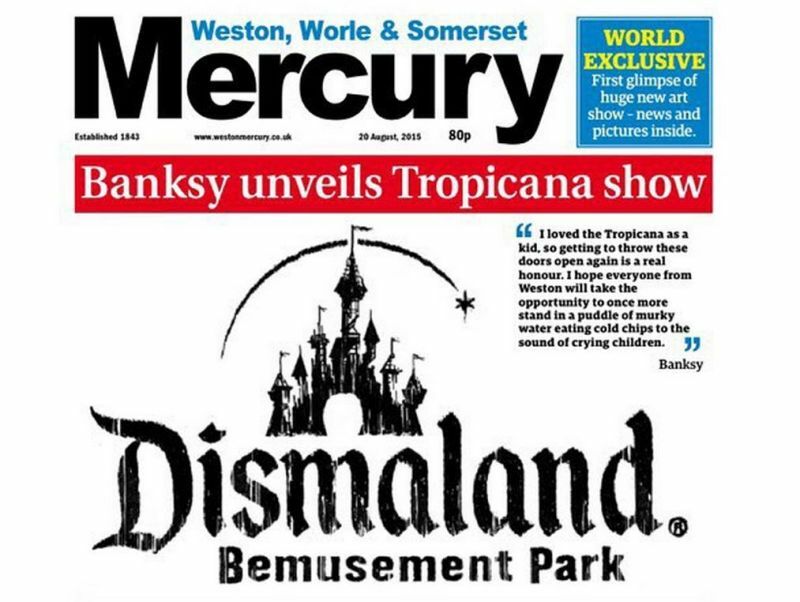 Banksy's official verified Facebook page, with 2.4 million likes, has been unverified because it is a fake. 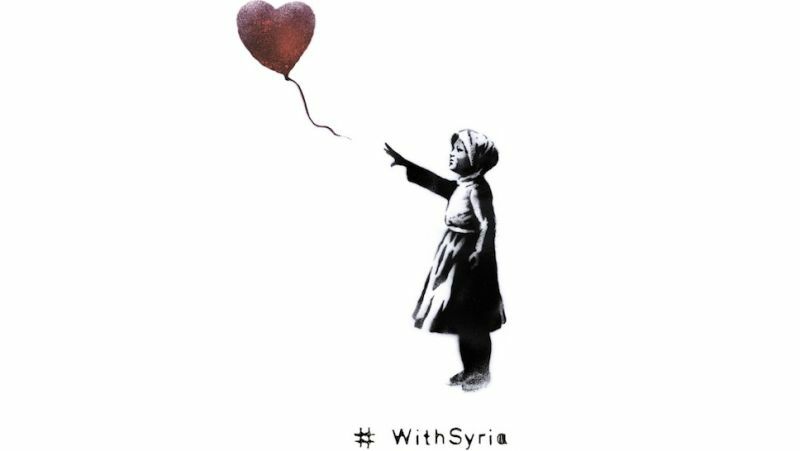 Elusive British street artist Banksy, whose art showed up in a number of places in New York last fall, is scheduled to widely share new art on the third anniversary of the Syrian Civil War over the next few days. 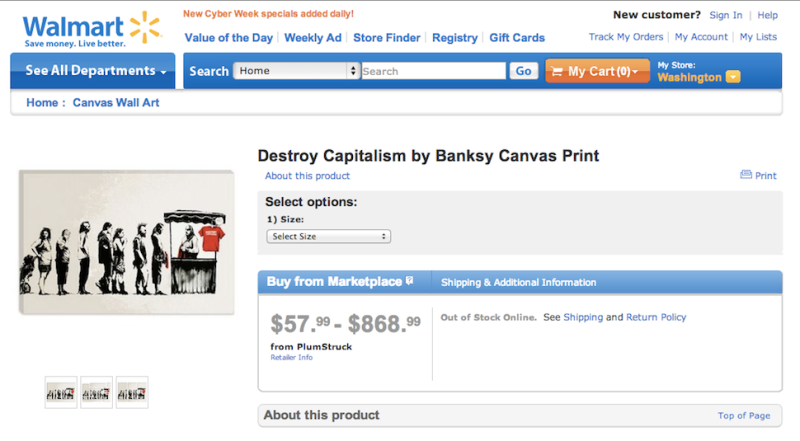 Walmart Was Selling Knockoffs of Banksy's "Destroy Capitalism"
Up until today, Walmart was selling Banksy knockoffs on the Walmart website. The company has since disabled the listing, blaming the irony on a third-party vendor. Capping his month-long residency in New York City, Banksy donated a work of art titled "The Banality of the Banality of Evil" to Housing Works, a charity that provides housing to the homeless and AIDS patients. The work was to be auctioned off to raise money for the charity, but in classic fashion for the reclusive artist, the auction devolved into finger-pointing and accusations, with the anonymous winning bidder backing out of their bid. 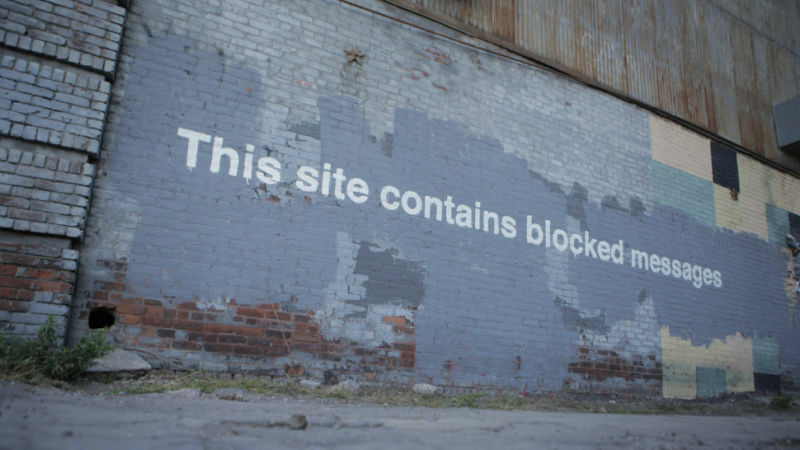 Banksy's newest NYC piece (and perhaps the last of his month-long stay here) is on the side of a warehouse in Queens. It's made out of balloons. 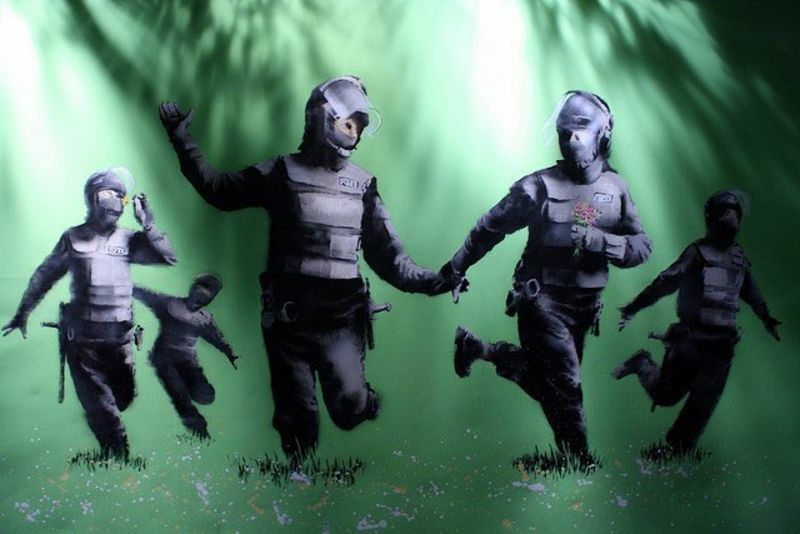 And here is the inside story of Banksy's first NYC show a decade ago. The fuss was somewhat smaller then. Today's new Banksy NYC piece is a robot stenciled on Stillwell Avenue in Coney Island. Care of ANIMAL New York, here's today's new Banksy piece, this one in Greenpoint Brooklyn. But this was actually his backup plan for today. At dusk, Banksy revealed the newest piece in his month-long rampage of New York City's streets: a Grim Reaper in a scythe-powered bumper car, listlessly bobbing to Blue Öyster Cult's "Don't Fear the Reaper." The installation sits at the corner of Houston and Elizabeth Streets and, according to Banksy's site, will remain there through Sunday. Here is a thoughtful article, in the New York Post, about the "complex prestige game" that informs the New York graffiti community's disdain toward Banksy: "'Street art' is associated with whimsy and even gentrification—things the mainstream considers socially good, or at the least, nondestructive." 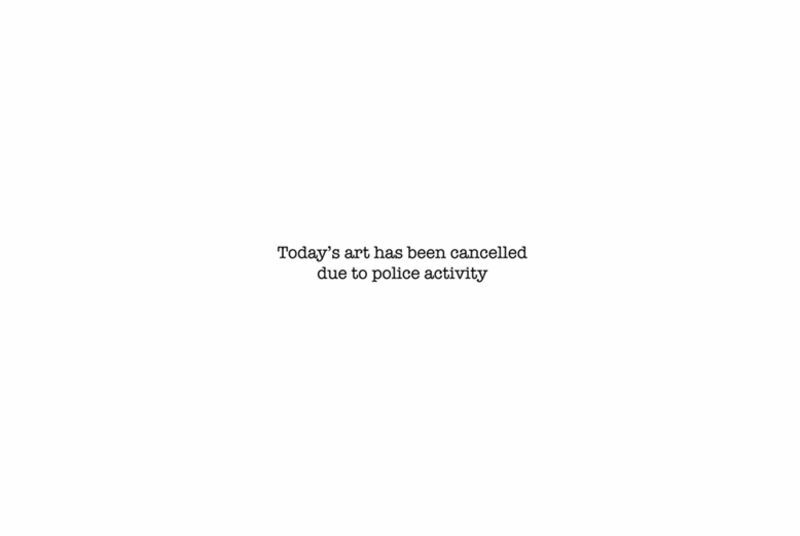 Banksy Says He Took Today Off Due to "Police Activity"
Gee, where is today's daily new Banksy artwork, somewhere in New York City? He's been unveiling a new one every day in October. Not today, though. 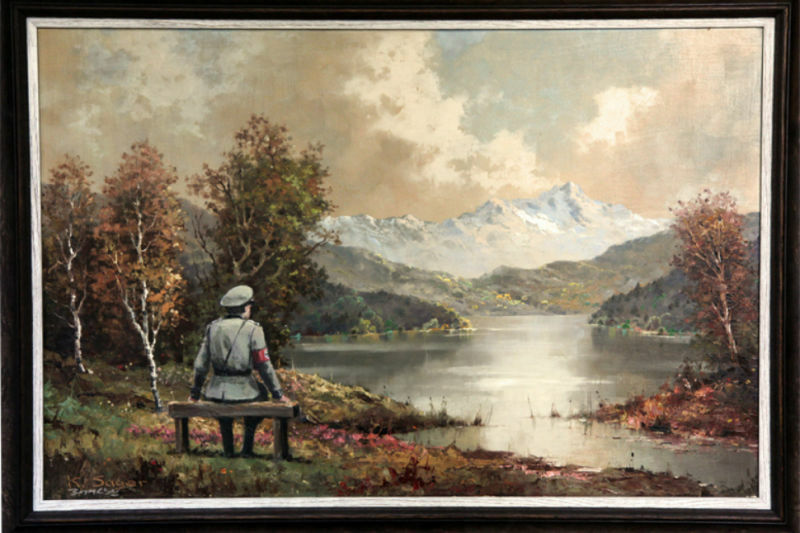 One week after Banksy tried and failed to sell his valuable works of art for $60 a piece to random passers-by in Central Park, three artists decided to set up a similar stand of Banksy canvases, but with one very crucial twist: Their wares were admittedly fake. The newest Banksy NYC piece is on 153rd St. in the South Bronx, and already getting tagged up, naturally. Woman Whose Pug Tinkled on Banksy's Art: "Dogs Are The Original Taggers"
On Tuesday, a ferocious vandal urinated on Banksy's flower-bursting Twin Towers stencil, as a cluster of awestruck humans watched. The culprit's name is Freddi, he's an eight-year-old pug, and his caretaker is Elisa Casas, a lifelong New Yorker who was also cast on the Sundance Channel reality show Girls Who Like Boys Who Like Boys.